Product prices and availability are accurate as of 2019-04-12 22:24:28 EDT and are subject to change. Any price and availability information displayed on http://www.amazon.com/ at the time of purchase will apply to the purchase of this product. 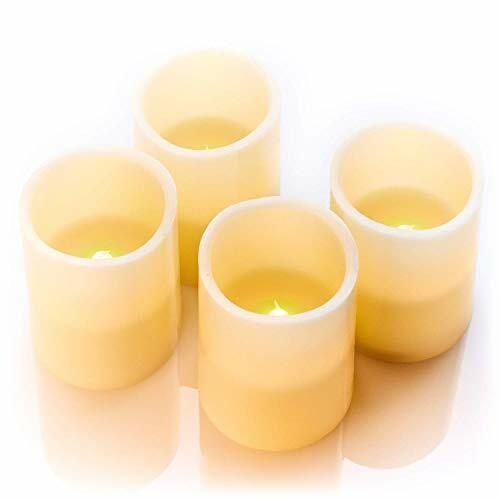 Our LED candles are made of real wax which makes them look and feel like a conventional candle. The subtle flicker simulates just how a real flame would move. Other flickering candles can look like the flame is flashing or blinking. The flame sits deep inside each candle, so the LED candle lights are kept more discrete. 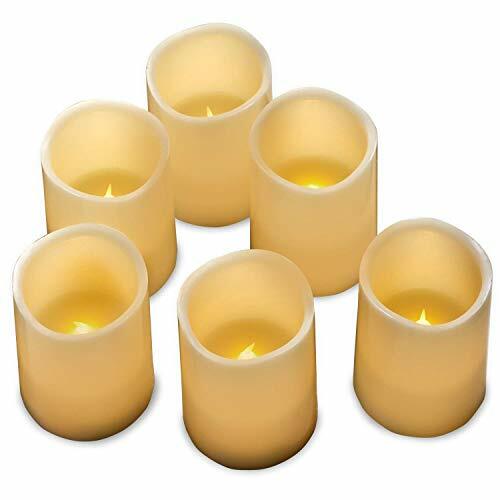 Each candle emits a soft yellow, amber glow which gives the appearance of a natural flame. Simply turn the switch to TIMER and the flickering candle will light up for 5 hours and then automatically turn off for 19 hours. The next day it will turn back on at the same time as when the candle was turned on the previous day. Each candle requires 2 x AA batteries (not included) which will last approx 250 hours. 1. You will see much longer battery life from a Duracell or name brand battery then you will from a cheaper brand of battery. 2. If you turn your candles on and off manually, you can expect to see longer battery life. Use of the timer mode will shorten battery life slightly, as this function is still using the battery even when the candle has turned itself off. 3. Batteries exposed to prolonged heat will have diminished battery life. 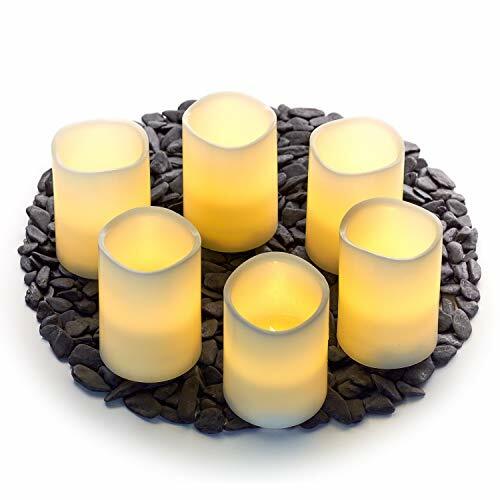 Our Flameless LED Candles can be used safely where conventional candles can't. They give you piece of mind along with no smoke, no odor and endless possibilities on where to use them. Our candles are made to a very high standard and are well packaged. If for any reason you are not satisfied with our Flameless LED Candles, let us know and we will make things right! 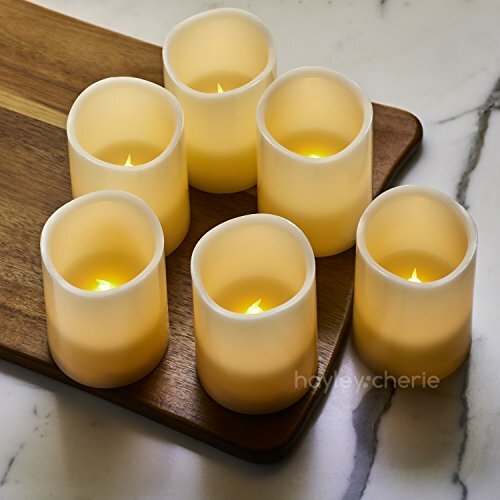 5 HOUR TIMER - Set Of 6 Flickering Flameless Candles with timer (5 Hours On and 19 Hours Off). The timer makes our pillar candles so convenient to use... have them set to come on each day as it gets dark and they will turn themselves off 5 hours later. MADE WITH REAL WAX - Each LED candle is made with genuine CANDLE WAX and has a realistic flickering effect. The flame sits deep inside the candle and the SUBTLE FLICKER and amber glow gives the look of a real candle. 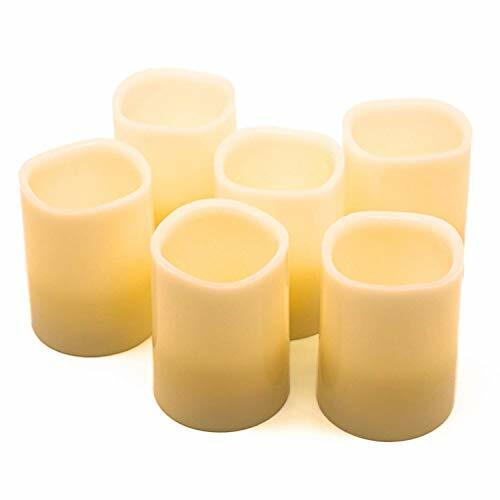 Our Ivory Wax Candles are 3" wide x 4" tall and are UNSCENTED. 100% SAFE & NO MESS - No messy wax, no fire hazard and they are safe to have near children and pets. They are perfect as centerpieces for special occasions such as weddings, christmas, halloween, thanksgiving and parties. Or give them as a gift. HIGH QUALITY - Our flameless battery candles combine both the convenience of a timer and the realistic appearance of a conventional wax candle. 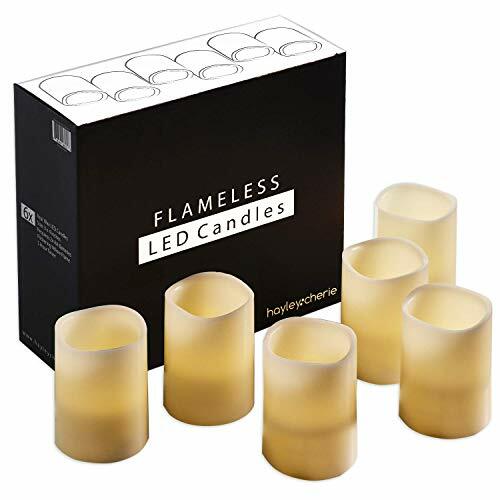 Each set is well packaged, but if any LED Candles do arrive damaged, just let us know and we'll get a replacement in the mail ASAP at no charge! EASY TO USE - Each battery operated candle has a simple ON/OFF/TIMER option located on the bottom of each candle. This product requires 2 x AA batteries for each candle. NOTE: Batteries are not included.